Journal : Glasgow Medical Journal ; vol. x.
Glasgow : Dunn & Wright, 1878. Description : [1 l.] pl., -530 p. ; ill.: 1 phot. ; 22 cm. 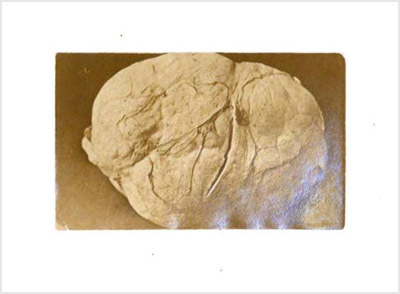 Photograph : mounted albumen of the resected specimen. Subject : Breast — Benign tumors. Author caption: By Alex. Patterson, M.D., Surgeon and Lecturer on Clinical Surgery, in Glasgow Western Infirmary. The photograph displays what appears to be a fibroadenoma removed from the right breast of a 21 year-old maiden. Judging the tumor benign, Patterson waited a year before operating. The first bibliography of "true adenomas" of the breast was compiled by Samuel Weissell Gross (1837-1889) in 1880, who found only 18 cases in the literature — this paper was not one of them.